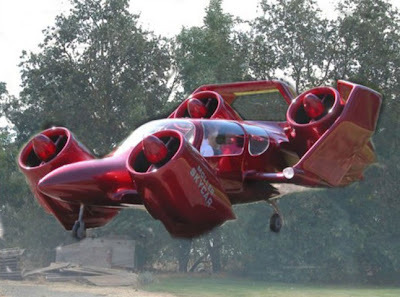 Moller M400 Skycar: 375mph Car/Plane to Hit The Roads, Skies. The Skycar is an interesting personal aviation project under development by Calfornian company, Moller International. Their flying car is much more than just a concept or even a base prototype like the one we saw on ebay recently. Testing is already underway (video below) and FAA approved models are expected to be available to the public before 2015. Apparently the company already has over 100 reservations for the $500,000 SkyCar which will be capable of a top speed of 375mph and get you 750 miles. The Skycar runs on ethanol rather than costly aviation fuel making it, as they claim, cheaper to run than a Land Rover or Porsche. 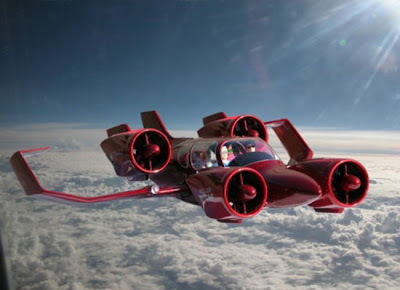 The plane, which can also drive on the road at up to 35mph, will use eight Wankel rotary engines instead of jet engines – in order to keep the cost down. Perhaps one of the biggest challenges of this project will be one of Moller’s aims – to make the flying car foolproof so that ordinary drivers can fly it. The craft’s eight engines enable a safe landing should one, or even a few of the engines be struck by mechanical problems, or even failure. The Skycar would also come, as you’d expect, with parachutes should you need to eject. Engineers are working on cabin pressurization so the craft can soar to 30,000ft. Now that would be a rush.